The proposal from a group of pro-abortion MPs to extend the 1967 Abortion Act to the North of Ireland was scheduled to come before Parliament on 22nd October during the debate on the Human Fertilisation and Embryology (HFE) Bill. This was the first time in nearly 20 years that MPs had a chance to vote on the issue. However, Precious Life’s campaign to stop the extension of the Abortion Act resulted in a “pro-life tidal wave” that forced the government to effectively scrap the proposal. Like all of Precious Life’s work, our campaign to stop the 1967 Abortion Act required a combination of prayer and action. It began in January when we launched a Postcard Petition Campaign calling on the Secretary of State to ensure any legislation regarding abortion would be dealt with only by our local Assembly. Between January and October, hundreds of thousands of postcards were distributed across the province. During Lent, we launched our “40 Days for Life” with people all across Ireland praying and fasting for the protection of our unborn children from abortion. We held monthly meetings with the All Party Pro-Life Group of the Assembly to discuss how to challenge the abortion threat from Westminster. As a result of these meetings, the leaders of our four main political parties took the unprecedented step of sending a joint letter to all Westminster MPs, calling on Parliament not to over-ride the democratic process here by attempting to impose abortion and stating the strong opposition from across the community. We wrote to the leaders of the four main churches, and they also sent a joint letter to all Westminster MPs stating that the law on abortion here should be a matter for the Northern Ireland Assembly. When the HFE Bill came before the House of Commons in May, Precious Life travelled to London to join the National Lobby of Parliament. In July, the government announced that the HFE Bill would be delayed until October. This delay allowed us to begin planning the “Rally for Life”. For the next six weeks we ran an intensive public awareness campaign, including public meetings, newspaper adverts, billboards, and street information stalls in towns across Northern Ireland. The response from the public was phenomenal. Old and new pro-lifers were fired up into action. People who have never been actively involved in pro-life issues before were contacting us asking for boxes of leaflets and posters to distribute. 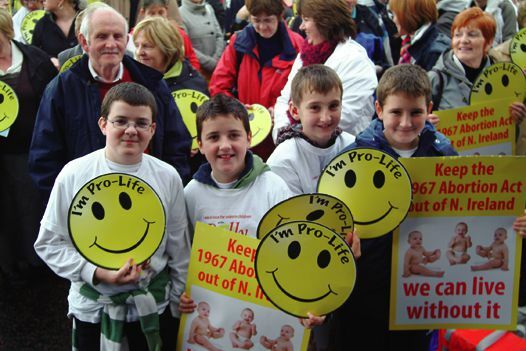 The North was blitzed with thousands of “Rally for Life” leaflets and posters. People all across Ireland – north and south – were organising buses to the Rally. Youth Defence did a great job in bringing eight buses from Dublin and other centres. Our phones never stopped ringing. There was a real positive buzz in the office as Precious Life’s dedicated volunteers worked long hours late into the night preparing for the Rally. And all this on top of our daily life-saving work outside the abortion referral agencies!!! Then the historic day arrived. On Saturday 18th October, convoys of coaches and buses wheeled in through the gates of Stormont carrying people from all across Ireland to the Rally. It was a real family friendly event, with colourful T-shirts, balloons, flags, banners, and music. Undaunted by the heavy rain, the enthusiastic crowd cheered as our local MPs and Assembly Members, and representatives of local, national and international pro-life groups pledged to stop abortion being forced on the pro-life majority. It was overwhelming to see thousands of people from the different traditions – men and women, young and old – standing united at this historic “Rally for Life” in defence of our unborn children. The “Rally for Life” was a tremendous achievement and gave the people of Northern Ireland a unique opportunity to send out the clear message to Westminster that we do not want the 1967 Abortion Act imposed on us from Westminster. The day before the abortion amendment was due to be voted on in Parliament, I travelled to London to make a presentation at 10 Downing Street of 120,000 pro-life petitions. I also went to the Houses of Parliament to deliver the “Rally for Life” DVD to all MPs. These DVDs together with the 120,000 petitions ensured that Westminster could not ignore the opposition from the people of Northern Ireland to the extension of the 1967 Abortion Act. In the end, the Government simply couldn’t withstand this “pro-life tidal wave”, and the abortion amendment was effectively scrapped. I truly believe that future generations will look back in history to Saturday 18th October 2008 and remember when God ’s people stood in unity at Stormont and proclaimed to the Westminster Government, and indeed to the world, that they would never accept the murder of our unborn children. The Bible tells us that when people dwell in unity, God commands a blessing on them (Psalm 133). From the bottom of my heart, I thank all our supporters for enabling all this to come about. It was because of their financial sacrifices, and their prayers and fasting, that we were able to achieve this historic victory. I also thank everyone who distributed our postcard petitions, and our Rally leaflets and posters, everyone who organised buses to the Rally, everyone who helped in any way with the Rally, and of course, everyone who attended the Rally. I also commend the politicians who stood up against Westminster and demanded the protection of unborn children.